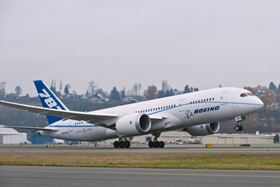 The sixth 787 – ZA006 – departed Boeing Field in Seattle on 6 December and completed an around-the-world trip on 8 December that led to two different world records. The 787 Dreamliner now holds the record for the longest flight and the fastest speed around the world for its weight class. The route took the aircraft from Seattle to Dhaka and back to Seattle. Six pilots shared duties during the two days of flying. "Speed and distance capabilities are fundamental to the value the 787 brings to the market," says Scott Fancher, vice president and general manager of the Boeing 787 programme. "These records are a great way to demonstrate that this airplane is the game-changer we have promised." The construction of the 787 Dreamliner is 50% composite materials. The sixth 787 Dreamliner, ZA006, powered by General Electric GEnx engines, departed from Boeing Field in Seattle, Washington, USA, at 11:02 am on 6 December and set the distance record for its class (440 000-550 000 lbs) with a 10 710 nmi (19 835 km) flight to Dhaka, Bangladesh, with credit for 10 337 nmi (19 144 km). This record had previously been held by the Airbus A330 based on a 9127 nmi (16 903 km) flight in 2002. Following an approximately two-hour stop for refueling in Dhaka, the Dreamliner returned to Seattle on a 9734 nmi (18 027 km) flight. The Boeing aircraft landed at 5:29 am on 8 December, setting a new record for speed around the world (eastbound) with a total trip time of 42 hours and 27 minutes. There was no previous around-the-world speed record for this weight class. How safe are modern aircraft with carbon fiber composite fuselages in a survivable crash? As research into how carbon fiber composites will perform in an airplane crash is ramping up, we talk to one of the researchers investigating it.